Information on rules residents should be aware of regarding anything from signs to external maintenance requirements. This is an excerpt of article 3 from the GVRCA CC&Rs. It is not a substitute for the complete document. No Lot, Parcel, Development Tract, Other Area, GVR Common Areas, Sub-association Common Areas or Association Property may be subdivided beyond that which is initially subdivided by Declarant (including, without limitation, the subdivision thereof into time-share estates) without the prior written approval of the Board and of the Architectural Committee; provided, however, that nothing in this Paragraph shall be deemed to prevent an owner from, or require the approval of the Board, for: (i) transferring or selling any Lot, Parcel or other property interest to more than one (l) person to be held by the master tenants in common, joint tenants, tenants by the entirety or as community property; or (ii) the leasing or renting by any Owner of all or any portion of his property interest, provided that any such lease or rental shall be subject to this Declaration. 3.2.1 The foregoing restrictions shall not apply to a Development Tract or Area that is sold by Declarant to a Builder, Developer or other Owner with the agreement that such transferee shall be responsible to cause the requisite subdividing thereof, and in such case, Declarant shall notify the Board and the Architectural Committee of such fact. No sign, poster, billboard, banner, flag, advertising device or other display of any kind or nature (“Sign”) shall be installed or displayed without the prior approval of the Architectural Committee, except such Signs of customary and reasonable dimensions as may be displayed on a Lot or Parcel advertising the same for sale or lease. Such approval, if any, shall be consistent with the Design Guidelines, Development Standards and Master Sign Plan. The foregoing shall not apply to Declarant for so long as Declarant maintains control of the Association. 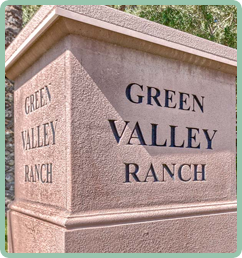 Builders and Developers shall be taken into consideration with respect to reasonable approval of signs in connection with the marketing, leasing and sale of its product in GREEN VALLEY RANCH. 3.3.1 No Owner, other Person or entity shall place or install any Sign of any type or kind or other Improvement, or alter or remove the Improvements on the Association Property or Common Areas unless such placement, installation or alteration is first approved in writing by the Board and the Architectural Committee; provided, however, the foregoing shall not apply to Declarant as otherwise provided in this Declaration. No animals, fowls, reptiles, poultry, fish, livestock or insects of any kind (collectively, “animals”) shall be raised, bred or keep within the Residential Areas of-the Property, except that a reasonable number of dogs, cats or other common household pets may be kept by owners within the Residential Areas; provided that they are not kept, bred or maintained within the Residential Areas for any commercial purpose, nor in unreasonable quantities nor in violation of any applicable Ordinance or any other provision of this Declaration, and such limitations as may be set forth in the Rules and Regulations. No rubbish, trash or debris of any kind shall be placed or permitted to accumulate anywhere within the Property, and no odor shall be permitted to arise therefrom so as to render the Property or any portion thereof unsanitary, unsightly, or offensive. No noise or other nuisance shall be permitted to exist or operate upon any portion of a Lot, Parcel, Development Tract or Other Area so as to be offensive or detrimental to any other Lot, Parcel, Development Tract,Other Area or to Owners or occupants thereof. Without limiting the generality of any of the foregoing provisions, horns, whistles, bells or other sound devices (other than security devices used exclusively for security purposes),noisy or smokey vehicles, large power equipment or large power tools, unlicensed off-road motor vehicles or other items which may unreasonably disturb other Owners or their tenants, invitees or licensees shall be located, used or placed on any portion of the Property without the prior written approval of the Architectural Committee. Exterior speakers are permitted to be installed by an owner or occupant, but same are subject to the foregoing limitations with respect to not unreasonably disturbing other owners and the like and are subject to the,Rules and Regulations. Alarm devices used exclusively to protect the security of a Lot, Parcel, space within a Commercial Area,or Other Area within the Property and its contents, shall be permitted, provided that such devices do not produce annoying sounds or conditions as a result of frequently occurring false alarms. 3.6 Exterior Maintenance and Repair: Owner’s Obligations. No Improvement anywhere within the Property shall be permitted to fall into disrepair, and each Improvement shall at all times be kept in good condition and repair. If any Owner shall permit any Improvement, which is the responsibility of such Owner to maintain, to fall into disrepair so as to create a dangerous, unsafe, unsightly or unattractive condition, the Board, after consulting with the Architectural Committee, and after affording the Owner of such property reasonable notice, shall have the right but not the obligation to correct such condition, and to enter upon such Owner’s Lot or Parcel, but not into a personal residence or commercial type building for the purpose of doing so, and such Owner shall promptly reimburse the Association for the cost thereof. The owner of the offending property shall be personally liable for all costs and expenses incurred by the Association in taking such corrective acts, plus all costs incurred in collecting the amounts due. Each Owner shall pay amounts due for such work within ten (10) days after receipt of written demand therefore. There shall be no interference with the established drainage pattern over any Lot, Parcel, Development Tract, Association Property, GVR Common Areas,Sub-association Common Areas or Other Areas so as to affect any other property unless an adequate alternative provision, previously approved in writing by the Architectural Committee, is made for proper drainage. Each owner within a Residential Area shall not allow or permit surface drainage on his Lot or Parcel to accumulate behind a perimeter wall or penetrate a perimeter wall and cause staining thereof. No unsightly articles, including clotheslines, shall be permitted to remain on any Lot, Parcel, Development Tract or Other Area so as to be visible from the public or private streets, Association Property, GVR Common Areas, Sub-association Common Areas or from any other Lot, Parcel, Development Tract or Other Area. Without limiting the generality of the foregoing, refuse, garbage and trash shall be kept at all times in covered, sanitary containers or enclosed areas designed for such purposes). 3.8.1 As to Residential Areas, such containers shall be exposed to the view of neighboring Lots or Parcels only when set out for a reasonable period of time (not to exceed twelve (12) hours before and after scheduled trash collection hours). 3.10 No Mining and Drilling.